"At the very least, this would hand Mr Bernanke a new weapon. Only by experimenting will we find out if it has the firepower to break deflation." If we get back to march09 lows everyone will be talking about this read button, since it is the only weapon left. which points to the evidence that people are willing to sustain small nominal losses to preserve spending power (wrt recent -8 bp TIPS yield). Interesting. For the one from Voxeu, the caveat is : "all reserve nations must agree to protect against using foreign currencies as an alternative means of exchange".
" small nominal losses t" - only for a short period of time and only a selected few, I would think. I will just convert my currencies into other countries government bond. Negative interest rates - simple, withdraw all your money or convert it into another currency (or basket of currencies) or gold or a mix of those. No reason to keep it in any account. Yes, not sure how this would work. People would just change their money into other things. Perhaps shiny things. Any negative interest policy would send gold and silver parabolic, while ushering in hyperinflation to ALL fiat currencies as everyone rushes down Exter's pyramid. Edited August 15, 2010 by Mr. Spin esq. The very tip of the pyramid is silver. That is because of the savvy goldbugs rushing out of gold into silver when the elites decide to stop the proles hoarding gold. Taxing and outlawing silver will be problematic. 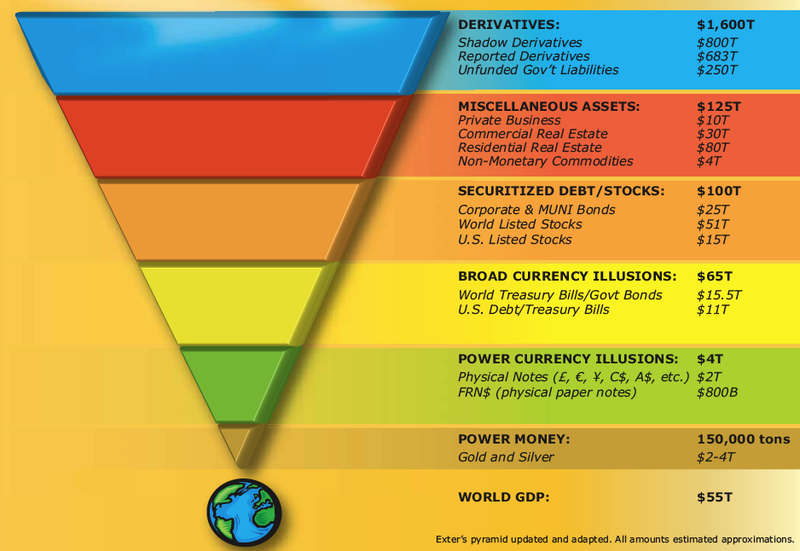 When we reach that far down Exter's pyramid there of course will be far more pressing things to worry about than monetary units of measure. Do the powers that be really want the masses to start withdrawing their life savings from the banking system? That's what they've been trying to avoid since the crunch began. They'll just pass a law, sorted. There is nothing a gun can't fix, apparently. As long as you stay in their system of stocks, bonds, houses - all of which are under their control it s fine. If you take your money and move it out of their control. NO, and they will shut down any and all options you have.. including gold. A way I am liking more and more to break the lower bound is interest rebates. So imagine you take out a loan and its a large commercial loan so somewhat risky and you are paying 6% rate. The money center bank borrows it at 0.0% from the central bank. (so cannot go lower on that front). But then a policy is in place that you get rebated for 33% of the interest you pay. So that takes the 6% down to a 4% loan. And effectively a base rate of negative 2%. Another idea is in these times when negative rates are needed, is to increase the official inflation target. Up to 3% or 3.5%. The 2% target means they can only get to at most 2% negative real rates(while honouring their pledge of 2%). Going up to 3.5% would give them an extra 1.5% in negative real rates. Now Britain has already defacto pushed up to 3%. But the USA and Europe are down around 1%.. actually under their official targets and falling. Beyond 3.5% and price changes in the economy become pronounced enough that it can change peoples behaviours. But down under 3.5% and for the average person inflation is invisible, so doesn't change their behaviours. And that is especially important for things like contracts they sign, business ideas they have, etc.. So this idea can only be taken so far. Its why when severely negative rates are needed, a whole tool box of creative ideas needs to be used. Honestly these two ideas I mentioned maybe could bring down average rates by 3%.. so get into negative 3%... but if negative 6% rates were needed then more ideas would have to be thought up. I guess rebates could be taken further.. like say outright the first 3% you pay in interest will be rebated 100%, and 50% of anything beyond that.